Capture your entire biking adventure by combining 2 Garmin devices. 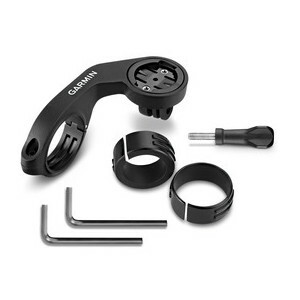 This cycling combo mount reduces overall weight and mounting complexity by offering a simple and solid solution for mounting an Edge® and a compatible VIRB action camera to your handlebars. The mount with extended arm allows you to stay in a comfortable heads-up position (Edge attaches to the top; VIRB to the bottom of the mount) for easier monitoring and improved safety.